There was little magic in this FA Cup quarter-final on an afternoon when, for once, Liverpool’s free-flowing football deserted them in the face of a committed and well-organised Blackburn side. A 0-0 draw meant that the Reds failed to score for only the third time in the last 12 matches as mid-tabled SkyBet Championship side Rovers frustrated the home side. Blackburn succeeded where, a week ago, Premier League champions Manchester City had failed in not only keeping a clean sheet but avoiding defeat as they brought their hosts’ five-match winning run at Anfield to an end. However, based on their first-half performance, there may be a tinge of regret on Blackburn’s part that they are not already celebrating a trip to Wembley. 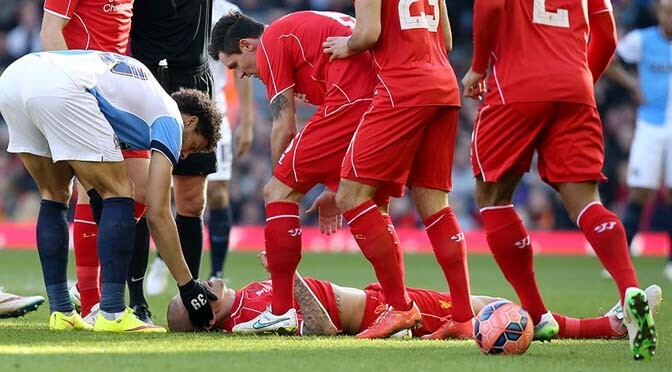 An eight-minute injury delay for Martin Skrtel, who fell awkwardly in an aerial challenge with Rudy Gestede and appeared to briefly lose consciousness before being carried off wearing a neck brace, disrupted the flow as early as the third minute. Blackburn responded to the lengthy break better and threatened to overwhelm their off-key hosts, who struggled to dominate midfield with Emre Can replacing the injured Joe Allen. Gestede, Rovers’ 15-goal top scorer proved to be a handful for a remodelled defence which now had substitute Kolo Toure at its heart with goalkeeper Simon Mignolet also enduring his fair share of aerial tests. Toure’s reading of the game allowed him to cut out a break from Craig Conway but the Blackburn midfielder was able to regain possession and swing over a cross which Glen Johnson chested narrowly past the post under pressure from Gestede. Conway was less precise with his next effort, blazing over when presented with a free shot after Toure had given the ball away and got caught out of position. Blackburn continued to dominate with Raheem Sterling, positioned out wide on the left, having to track back to block a Gestede but for all their pressure they could not force the breakthrough. Liverpool’s efforts were sporadic with Adam Lallana having a penalty claim turned down for a challenge by Matt Kilgallon, Toure blasting home only to be denied by an offside flag and Daniel Sturridge’s fierce effort in added time parried away by Simon Eastwood. If the home side were hoping the interval would help put things right in the second half Alex Baptiste’s 49th-minute header, tipped over by Mignolet at full stretch, was a warning it would require more than a 15-minute break to alter the momentum. Liverpool needed something to jolt them into life and the introduction of Mario Balotelli just before the hour was aimed at doing that, although Toure again came closest to scoring with a header against the post from close range. Balotelli’s blast high into the Anfield Road End was evidence of the job Blackburn had done in frustrating their opponents, although Baptiste got away with a surreptitious shirt-pull on the Italy international as the match entered its last 15 minutes. Jordan Henderson’s angled drive was batted away by Eastwood as Blackburn mounted a determined rearguard action in the face of late pressure which saw Sterling head wide but the visitors fully deserved the chance for another shot at securing a semi-final spot on home turf. Previous PostDavis Cup: Andy Murray wins to wrap up GB victory over USANext PostWRC: Sebastien Ogier in a league of his own to score victory in Mexico.